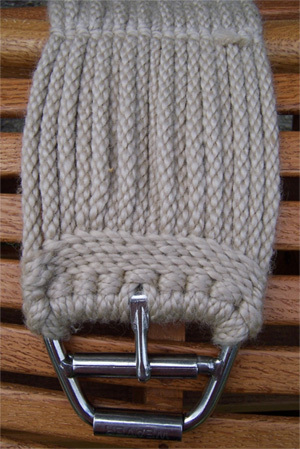 Mohair blend 17 strand straight cinch with roller buckles. Choose this cinch if you need one that is least likely to rub, chafe, pinch, roll or bother your horse. The design allows you to easily and humanely cinch up a horse more securely the first time, every time. The Smart Cinch features the patented Roll Snug Cinch Buckle. The unique tow roller design eliminates the need to pull leather against leather. The two rollers allow the latigo strap to roll freely. This gives the rider more leverage for easier cinching. If the Smart Cinch isn't the easiest cinch you have ever used, Weaver will replace it with a different Weaver cinch of equal value.